Drywall installation is an integral part of any construction project, but few property managers or owners know the real value of the framing behind the gypsum board. The framing of your building plays a big role in the final aesthetics and structural stability. If you were to peel back the drywall in your building, you’ll find either wood or metal studs. While lumber has long been in use throughout human history for construction, modern advances have helped to make steel a top choice in the industry. 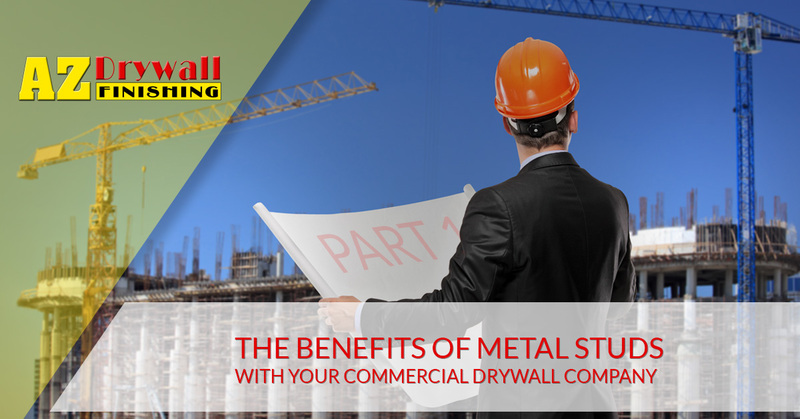 It’s important to find a commercial drywall company that has the experience and tools needed to provide top-notch metal studs framing to get your project done as soon as safely possible. If you are looking for drywall contractors in Chicago to provide comprehensive services that are built on decades of experience and a keen focus on the best outcome, AZ Drywall Finishing is here to help. Since 1999, our commercial drywall experts have worked to set the standard for quality in Illinois. Our drywall finishers are trained in a variety of renovation services, and our dedication to full-service customer care drives our reputation. Today, we’ll discuss the differences between wood and metal frames, as well as a few benefits you can expect from our metal studs framing services. When done, be sure to reach out to our commercial drywall experts for a quote on your project! This classic building material has been the mainstay of civilization for a long time, and for good reason. Wood is a versatile product that boasts renewability and favorable material costs. Lumber is also easy to cut and shape when compared to its steel counterpart. The thermal benefits of wood are a top reason why many people have stuck with traditional lumber over metal for studs framing. Steel studs have a rapid thermal transfer, quickly transferring heat or cold from the outside to the interior framing. While metal stud framing in the past was considered an exotic investment, today’s technology has helped to make this approach for businesses and homes more economical than ever before. Steel products are now at the limits of recyclability, recovering a majority of materials to be used in future products. Metal’s life cycle allows it to be used again and again with little to no concern for structural integrity. As your local commercial drywall contractors, AZ Drywall Finishing is proud to provide unbeatable steel framing services to create strong, cost-effective solutions for our business customers. Easy installation. Steel studs are designed to make the installation process as easy as possible. One immediate benefit comes from the product weight, where metal weighs a fraction of its counterpart. Metal studs also come with screws attached, making installation and corrections simple. The precise manufacturing process steel goes through also helps to ensure that your studs are level and plumb after installation. Convenient management. The lighter weight of steel is also coupled with its smaller stature, making your storage and transportation needs much simpler throughout your project. These construction benefits can help to cut down on the logistical costs involved with a project, saving you money once the project is done. In the drywall industry, consumers have a wide range of choices for how to outfit their businesses and homes. It’s important to know about your options before buying, as the right choices can result in beneficial outcomes at the end of your building construction or renovation. Next time, we will continue this subject by highlighting a few more benefits of steel studs framing. If you’re in need of an experienced team of drywall contractors in Chicago, be sure to reach out to our commercial drywall company. AZ Drywall Finishing has worked to establish a reputation of honesty, integrity, and high-quality outcomes on every project we complete. Contact us today to learn more or to receive a quote for your drywall installation services!